System for manual adjustment of the brightness of the instrument panel in relation to the exterior brightness. when the lighting reaches the maximum setting, release the button, then press again to reduce it, when the lighting reaches the level of brightness required, release the button. 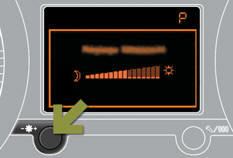 When the vehicle lighting is on, you cannot switch the instrument panel lighting off but you can adjust it to minimum. When the lighting is off, or in day mode on vehicles fitted with daytime running lamps, pressing the button does not have any effect.